Best Cydia alternative for all iOS devices – Hello guys, today I’ll show you guys a really amazing so-called Cydia/Jailbreak alternative for unjailbroken devices. now we have a ton of them. but this one is really different and it’s really amazing and in my opinion, this is the best one ever. So it’s really awesome, it’s a pack lot of features that the others don’t have. So let me show you first all about it what you can do with this new jailbreak/Cydia alternative and then I will show you how to get it and how to set it up on your device. 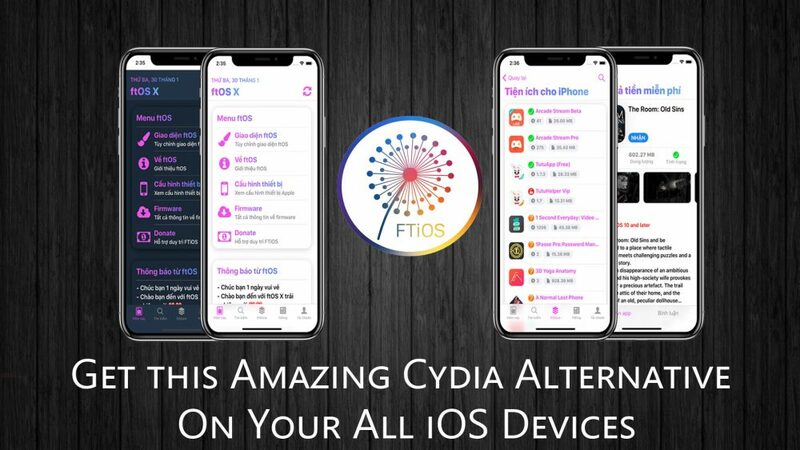 FTOS is the new best Cydia alternative for unjailbroken iOS 12 devices. it is really amazing. First of all, let’s talk about the given tabs. the ones that we will be using or the for today then you will have the firmware and then after that, you will have the FT store and then you will have the shortcuts, where you can get shortcuts for your iOS 12 device of course. So let’s start from the today’s tab. so if you go you will there FT menu and you can go ahead and theme the app and also change the language and then you will have specs for Apple devices. If you go right there then you can find a list of all the Apple devices and you can find these specs for every device. just tap on one of them and it will show you detailed information about the specs of each device (operating system, memory, network, connectivity, all that cool stuff). So that’s really amazing. also, you will have jailbreak checkers. you will have to create an account and login for that and then lower you will have information about FTOS. Let’s move on to the firmware tab and this is really interesting, you can go ahead and install the bata profile. to install iOS betas from here. Just tap on the upgrade iOS beta and it’s easy as that. you can install the profile and it shows you on which devices you can get it and then you will have block iOS updates. So you want to block your device from automatically updating. you can install the TV OS profile directly from here. so that’s really cool as well and also you will have a signing status right there. It shows you a list of all devices and you can go ahead and see, which firmware is actually being signed for that device. So that’s really really useful as well and also, you will have the latest iPhone firmware. You will have there a list of all iPhones, iPads, and iPod touches and you can see right there the firmware. Right here you will have instructions and remove ads if you want to get the VIP and then you will have the latest apps right there and lower you will have the FT store right there and you can find utilities for your iPhone jailbreak apps, apps with modded features then you will have free paid apps, duplicate apps all versions and also tweaked games. so you can get them all from the tabs. Some of the apps will require you to have TutuApp installed. if you want to install TutuApp then just tap on the TutuApp, click get and then click the little arrow. It will show the pop-up from where you can get TutuApp on your device in order for some apps to work which require you to have TutuApp. Now let’s talk about the utilities for the iPhone, where you can go ahead and find apps like movie apps, music apps, screen recorders all that great stuff. Also, you will have the jailbreak apps. so you can find all the Electra, all the jailbreak apps. you will have apps with modded features, where you can find like the ++apps, facebook, Instagram, Snapchat all that cool stuff. You will have free apps right there. you will have a list of apps as you can get for free on your iPhone and then you will have also duplicate apps. so if you want to have two copies of an app then you can get them from here. you will have old versions of the app. so you want to get any app on their old version then you can get it from here that’s really cool and you will have tweaked games. you will have a long list of tweaked games that you can get on your device. The last tab is the shortcuts. you can go ahead and find shortcuts and install them on your iOS 12 device. of course, shortcuts cannot be installed on older devices just on iOS 12 devices. so these are all the great features that you can get with FTOS a really great in my opinion the best Cydia alternative for unjailbroken devices. Now let me show you guys how to get it and how to set it up on your device. to get FTOS on your device all you need to do is just open the link that you will find right down below the paragraph. It will show you a webpage, just go ahead and click install right there and it allows you to install a profile on your device, which of course will install FTOS. Now all you need to do is just go to your settings once you go to settings make sure you go to general and then scroll all the way down to profiles and device management click on the profile and click install, click install once more to install and you’re good to go. you can go ahead and launch it on your device and you can set it up. so, on the welcome screen, you can choose English or Vietnamese I believe and then from here you can also go ahead and customize the app. So you can choose like a light theme and a dark theme. you can also choose different colors. so you can customize it any way you like. It will show you to sign in if you have an account or you can just go ahead and skip that and go ahead and use it. you will have all instructions click continue completed and you’re good to go. now you can start using FTOS as easy as that. you will get this best Cydia alternative on your unjailbroken iOS 12 devices. Thanks for reading this article. this is the best Cydia alternative guys that you can use on your all iOS devices. don’t forget to share and also visit daily on this website for more new articles.